Caleb Navarro was receiving a bunch of texts during his chemistry class but tried not to check them, though the Dominican University student had a pretty good idea what the flurry was all about. It's not often that you get mentioned in a speech by the President of the United States. Navarro, 18, was highlighted by Barack Obama in a speech, Dec. 4, in Washington D.C. for a summit about college opportunities for students. The president recognized Navarro for overcoming his challenges as a struggling student growing up on the West Side of Chicago. During high school, he got involved with the Chicago-based nonprofit OneGoal, which helps low-income, underachieving youth get into college. The organization's founder, Jeff Nelson, who is a former Dominican student, was also praised by the President. "The folks at OneGoal saw a spark of something that was special in Caleb. Once he joined their program, he started to believe that maybe he was capable of achieving more," Obama said, speaking to a large audience in the Ronald Regan Building and International Trade Center. OneGoal got its start as a pilot program at a South Side school in 2003. Then the nonprofit was formerly launched and expanded to other Chicago schools. In 2012, it expanded to other U.S. cities, including Houston. OneGoal targets struggling students to work with classroom teachers trained by the organization. In its first two pilot years, the organization saw student cumulative grade point averages jump from 2.95 to 3.4, with a rise in ACT scores, according to OneGoal's website. Since 2011, the nonprofit has worked with close to 1,000 high school students at 20 schools. Navarro, who attended Prosser Career Academy on the Northwest Side, got involved with OneGoal as a sophomore. He admitted to not taking school all that seriously up to that point. "Beforehand I just got by on barely average. I was fine with C's, and if I was getting a D in class, I really didn't care much. … I wasn't the best, so if I didn't get into OneGoal I probably wouldn't be doing anything right now, probably sitting at home wasting my parent's money," said the Dominican freshman a day after the President's speech. One of his teachers at Prosser, Andrew Stricker, encouraged him to apply for OneGoal. When he did, he found other struggling students needing help. "I guess it was kind of the environment because I was around students who felt the same way: 'Oh, college isn't a reality; this is for other people,' the kind of people who doubt themselves as being capable of doing more," he said. "And so when I found out that I had academic potential, that I was smarter than I thought I was, that's what really pushed me to do well in school." At Dominican, he's getting A's and B's and has close to a 4.0 GPA, which Obama also touted in his speech. The day before, someone from OneGoal called Navarro about being mentioned in the speech. One of Obama's speechwriters also called to make sure it was OK with him. Navarro said he didn't believe it was really from the President. Low-key and modest, he wanted to keep everything pretty quiet at school, but once his friends found out, they were really supportive, he said. Dominican wasn't aware of the D.C. speech until contacted later that day by OneGoal and Wednesday Journal, said Tina Weinheimer, the university's assistant director of public relations and communications. 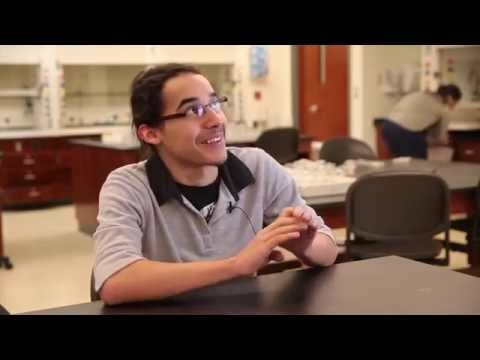 Navarro is currently studying biochemistry and hopes to be either a pharmacist or pharmaceutical engineer, but he definitely wants a career in medicine. He will still be involved with OneGoal until his sophomore year, but afterward he plans to keep in touch with the nonprofit. WOW. What a great story. Congratulations Caleb and all the folks at OneGoal.